President Emmerson Mnangagwa flanked by Vice Presidents Constantino Chiwenga and Kembo Mohadi congratulates Youth, Sport, Arts and Recreation Minister, Kirsty Coventry, after she took her oath of office at State House. Sport in general, and particularly gifted sports people, have been known to rouse feelings of national unity. In the process, they instil a sense of patriotism and pride in their countries. Good examples include George Weah, the soccer legend from Liberia now the president of his country and Imran Khan, the cricketing star from Pakistan, now its prime minister. Notable sports figures have managed, to some extent, to unify their troubled nations. In the process they have shown how powerful a force sport can be. This salient observation has not escaped Zimbabwe's newly elected president, Emmerson Mnangagwa. 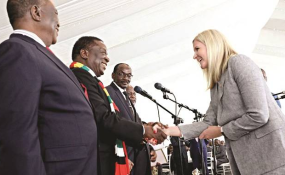 In a bid to restore and paper over the badly damaged relations between the governing Zanu-PF party and the country's white community both inside and outside Zimbabwe, Mnangagwa has appointed the former swimming sensation, Kirsty Coventry as Minister of Youth, Sport, Arts and Recreation. The 35-year-old is a seven time Olympic medallist. She is the only African to break the 1:00 min barrier in the womens 100m backstroke. She also has the highest number of individual Olympic medals of all female swimmers in history. But Coventry's appointment is not where Mnangagwa ended. He also reached out to the flamboyant footballer, Bruce Grobbelaar, the former goalkeeper for the Zimbabwean national football team as well as British football club Liverpool whose nickname is "Jungleman". In an interview he described Mnangagwa's call which started with the president saying: "Hello, Jungleman, how are you?" By wooing Coventry and Grobbelaar, Mnangagwa is clearly hoping to achieve a number of outcomes. The first is that he is hoping to repair the damaged relations between Zanu-PF and Zimbabwe's white community. As a long shot, he might also be hoping that this will help normalise relations with the West which could, in turn, unblock much needed foreign direct investment. When Zimbabwe gained independence in 1980 the country's population stood at just over 7 million people. The white population was around 230 000. This began to decline steadily white Zimbabweans began to emigrate to countries such as South Africa, Australia and New Zealand. The exodus increased significantly after 2000, when the Zanu-PF government began embarking on violent land grabs that resulted in Zimbabwe's economy going into meltdown. Zanu-PF's fractured relationship with the white community dates back to Robert Mugabe's rule. He presided over the breakdown in relations when he began implementing a violent land reform programme which ended up benefiting Zanu-PF members and chiefs. And in 1980 Mugabe retained white Zimbabweans such as Ken Flower. Flower had been in charge of Rhodesian prime minister Ian Smith's intelligence services which had been accused of masterminding the assassination of some of Zimbabwe's leading nationalists such as Herbert Chitepo and Jason Ziyapapa Moyo. But this rosy relationship turned sour in 1999 when the white community rejected a draft national constitution that included a clause on redistributing the country's most fertile land - the bulk of which was in the hands of around 4 000 White farmers - without compensation. In the intervening years Zimbabwe's political and economic landscapes have continued to deteriorate as the country became a pariah state and a basket case. This was largely because of the punishing ramifications of the sanctions and the corruption and ineptitude of the Mugabe regime. Zimbabwe's economic crisis reached its peak in 2008 when hyperinflation reached a stupendous 231 million percent, officially, even though leading inflation experts such as Steve Hanke estimate that the country's inflation rate far exceeded the official figure.